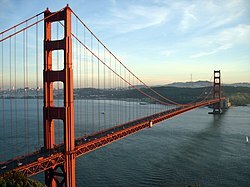 The Golden Gate Bridge has withstood 75 years that included high winds and other inclement weather. See how engineers have worked to keep it safe and stable. The Daily Journal has the story. ASCE's Pinterest boards have a ton of great resources, including sustainability, humor, bridges, and more! Technology has brought efficiency and safety to bridge design. Take a look at these "smart" bridges in Mashable’s article. Check out our very first customer spotlight: Atlantic Steel Detailing LLC! Learn about the company and see project images of Atlantic's cutting-edge work on the Forestville School in our blog post.